What place has comfortable chairs? 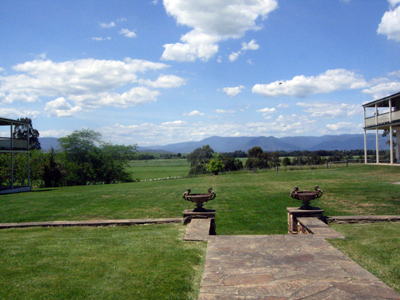 It's the answer to that question that sees us heading to the Yarra Valley for a visit to Chateau Yering. 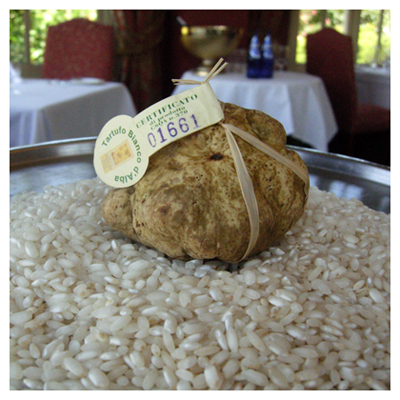 Well, that and the small fact that their Alba white truffles just came in early this morning! 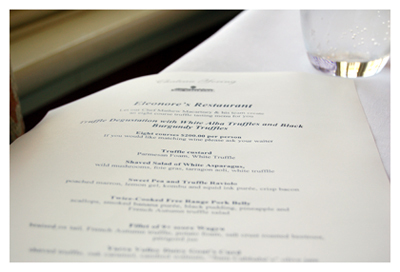 Eleonore's at Chateau Yering will be hosting a series of truffle dinners - the first of which was last Friday, the next is tonight (Saturday) with another happening next Saturday. 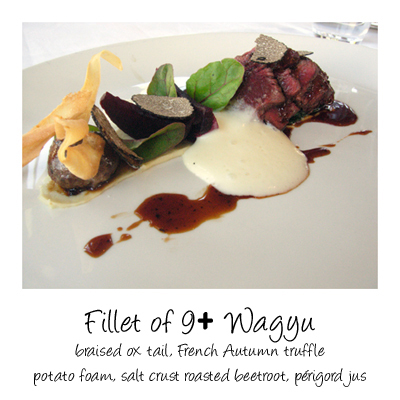 From our experience of their previous truffle dinners, it is something you really don't want to miss. 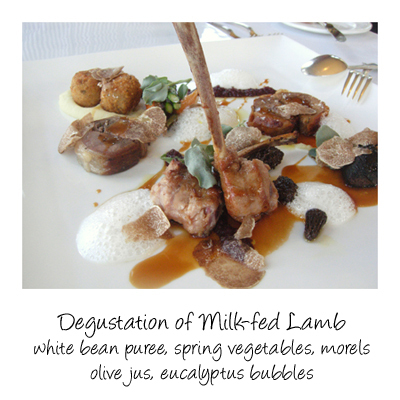 For lunch, we are given the option of ordering a la carte, partaking in their regular degustation or trying the truffle degustation. 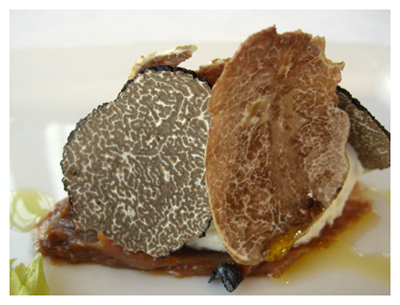 We pretended to mull over the decision so not to appear too pathetic and desperate, truffle degustation for 2 thank you! 01161, my pretty, how delicious are you. It's a duck egg and just under the luxurious topping of shaved white truffle is parmesan foam and under it, a beautifully runny and golden yolky custard sweetened with a little maple syrup. 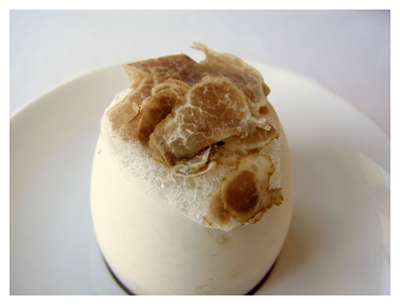 truffle and egg, just one of those perfect marriages. I'm particularly taken by the presentation of the foie gras as these ultra fine shavings, enough to pick up and once in your mouth, just melt in the heat. 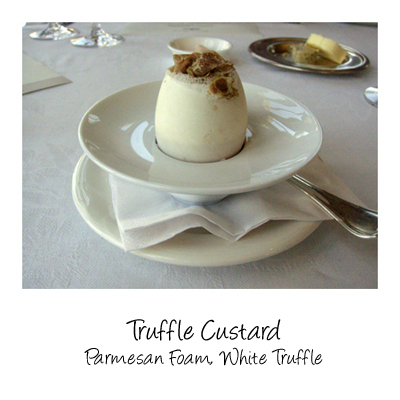 It lengthens and intensifies the flavour of the other ingredients without adding too much richness. 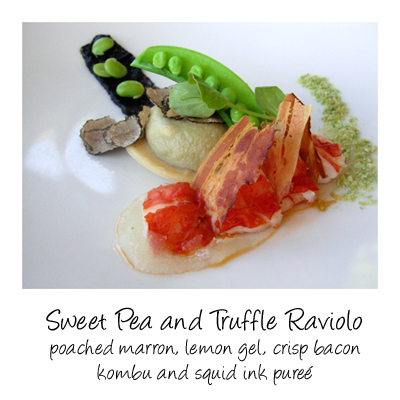 The marron is poached and slightly smoked and sits on a lemon gel, shards of crisp bacon separate the pieces. We found the truffle in this dish to be the glue which brings the dish comes together, offsetting the sweetness of the pea. There was one niggle on this dish and that was the edge of the pasta where the two layers joined was a little chewy, another 30 seconds or so and it would have been perfect. This is the dish that had us reading and re-reading its description - banana, pineapple, black pudding, truffle, pork and scallops - we were absolutely intrigued to see how this would all come together. 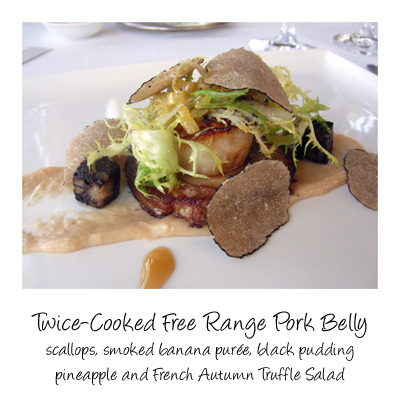 The pork belly has been rolled and is presented sliced at the bottom of the plate and topped with a plump scallop. The tiniest dice of pineapple is sprinkled over the frisee and it rests on the scallop - on the sides are two cubes of seared black pudding which rest on the smoked banana puree. The black pudding is a knockout - spicy and tender, the belly just falls apart with a touch of the fork. The pineapple and frissee combine quite well, just bringing in a touch of sweetness to offest the slightly bitter leaf. 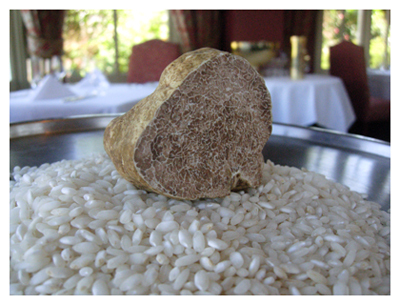 just look at that beautiful slice of truffle! 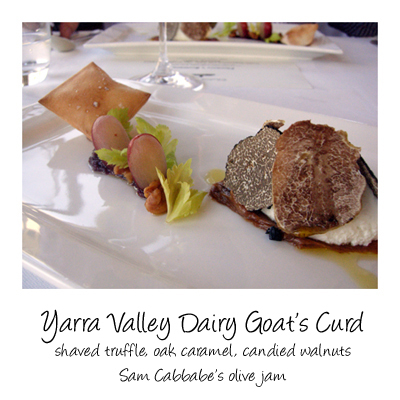 This course isn't part of the degustation but it is on the regular menu and it was very kindly sent out as a treat from the kitchen. The meat comes from 8 to 9 week old lambs which are bought in as whole carcasses. At the front and center are two lamb cutlets which are so tender and delicate they are almost veal like in taste and texture. 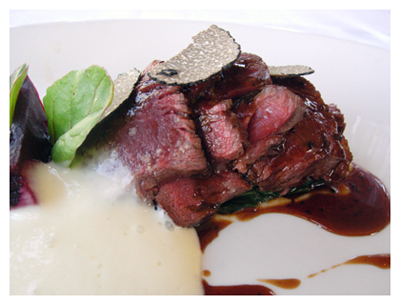 To the right, hidden under truffle shavings is a piece of the rump marinated in olive and squid ink. At the back and to the left are lamb rillets that have been crumbed and fried. 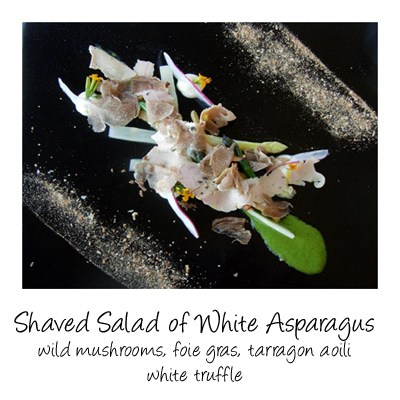 There are also rounds of shoulder and leg and dotting the plate are sprigs of saltbush. It's fascinating and tasty to see how different the various parts of the one animal can be. 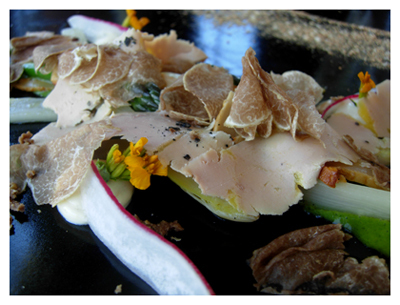 The only problem is that this dish will only be on the menu for a few more weeks and then the season will be over. The lamb cutlets for me have been a revelation. A classic combination beautifully presented. One thing, do make sure you have some bread left as the perigord jus is utterly delightful. Underneath the parsnip chips is the crépinette coated orb of braised ox tail. Perfectly cooked beef, worthy of a close up. 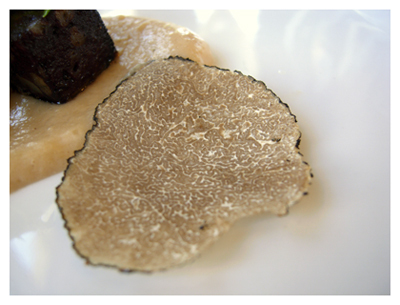 I just loved this dish at the last truffle dinner and it's even better now. 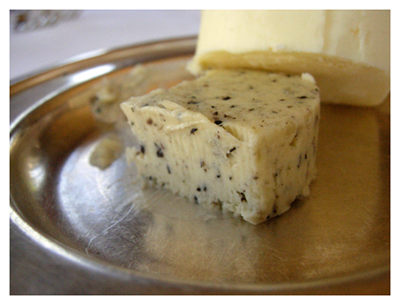 This time the curd is surrounded by shavings of white and black truffles and it sits on a thick smear of that divine oak caramel. 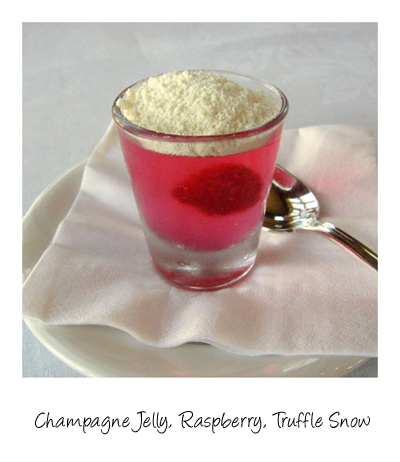 The champagne jelly carries those champagne characteristics - acidic and not overly sweet and suspended within it, a fresh raspberry. 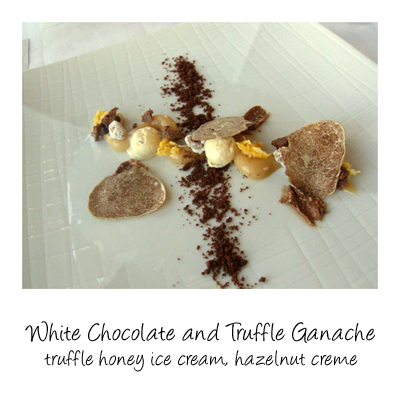 The topping of truffle snow is a mix of white chocolate and truffle which just dissolves as soon as you put it in your mouth, releasing those amazing truffle flavours. 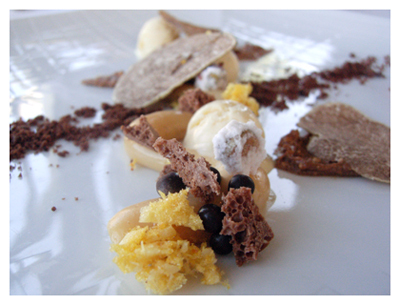 White chocolate truffle ganache, milk chocolate truffle aero, honeycomb, tiny chocolate balls, truffle honey ice cream, hazelnut creme and chocolate soil. Wow! 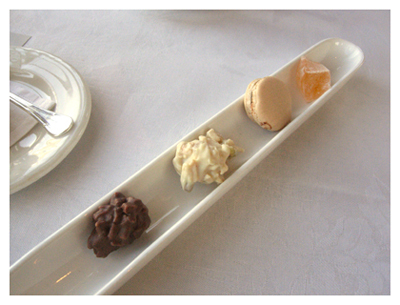 To finish, petit fours with our coffee. If you've made it to the end of this post, what are you still doing here, go to the phone and get booking! Looks all so wonderful. I especially like the look of all the sweet chocolate dishes!